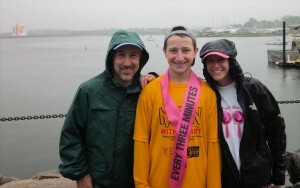 For the 10th year, the Post Family is participating in the Avon Walk for Breast Cancer in Boston. This means Rhonda is now celebrating 10 years of being cancer free. To mark this monumental occasion, Larry has decided to leave behind his Gear and Tent Crew and will be joining Austin as a walker for the first time. As Austin has done in the past two years, they will walk as Men With Heart, supporting all walkers along the 39.3 mile route by carrying supplies and singing uplifting songs. Rhonda will continue to crew as part of the Sweep Team. As most of you know, breast cancer has been a part of our family for a long time. Three generations of women in our family have fought and won against this disease. It is our hope that no future generation will have to go through that experience. This year, we are participating in support of our close friend Kristy Donaghy who was recently diagnosed with breast cancer. For Larry and Austin to both walk, they need to raise $3,600. Help them walk as Men With Heart so we can all fight this disease. Support in any amount would be great and generous of you. To donate by credit card, just click on the button below, which will take you to a secure PayPal page. Click here to learn more about Men With Heart. Click here to see how your donation will be used in the fight against cancer. Click here to get information about joining the Men With Heart team.